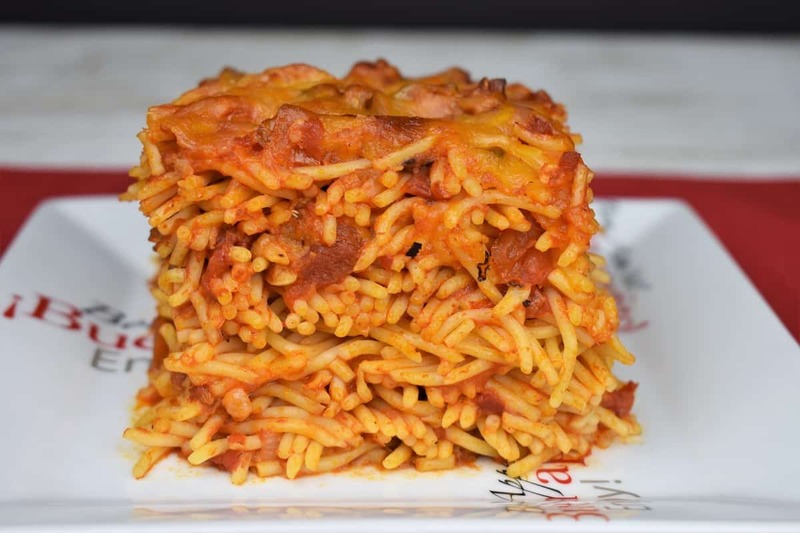 This baked spaghetti is really easy to make, and is sure to become a family favorite. We start with convenience ingredients like jarred pasta sauce, but add a special touch with onions, lots of garlic, flavorful Italian sausage, and fire-roasted tomatoes. 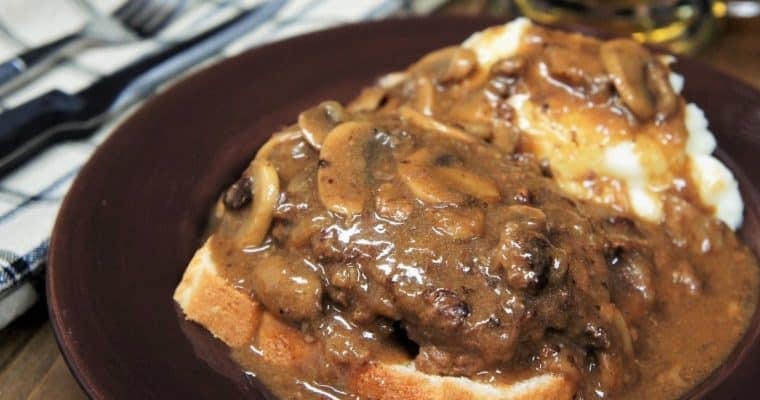 The sauce will take less than an hour to cook, yet tastes homemade. The rest of this dish is simple, boil some pasta, add cheese and bake. Baked spaghetti is great when you need to feed a crowd. Add salad and garlic bread as sides, and really stretch a serving. 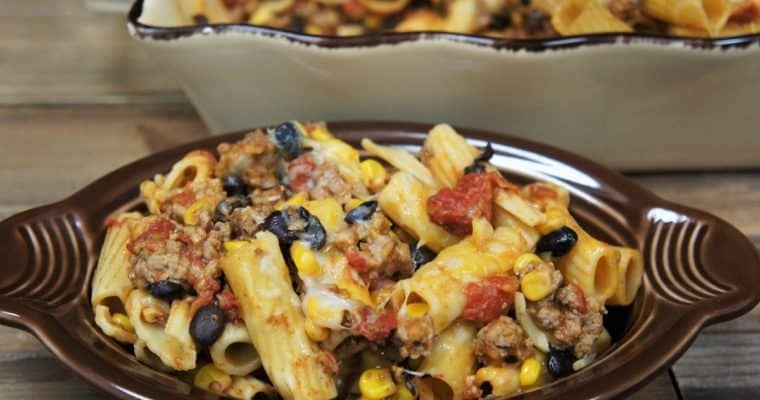 If you’re in a hurry, but still want a home-cooked pasta dinner, try this Italian sausage rigatoni. It’s just as good, but comes together a little quicker. Enjoy! If you’re using sausage links, remove the sausage from its casings. Use a sharp knife tip, and run it along the sausage lengthwise. Remove the casing and tear the sausage into small pieces. This will make it much easier to break up the sausage once it hits the skillet. Don’t add salt to the sauce until it’s done. The sausage, pasta sauce and canned tomatoes all contain salt already. When the sauce is done, taste it and then add salt, if needed. Heat the olive oil in a large, deep skillet or pot over medium heat. Add the onions, cook approximately 3-5 minutes, until they start to soften and become translucent. Stir them frequently so they don’t start to caramelize. Add the garlic and oregano and cook 1 minute, stirring frequently. Add the sausage to the pan and raise the heat to medium-high. Stir the sausage, breaking it up using a wooden spoon or a spatula. Cook approximately 5 minutes until the sausage is brown. Add the chopped tomatoes and the pasta sauce to the sausage and stir well. Bring the sauce to a simmer, lower heat to medium-low and cover. Cook the tomato sauce for 30-35 minutes, keeping it at a simmer. If it starts boiling too vigorously, lower the heat a bit, stir occasionally. Cook the spaghetti according to package directions for al dente. Remember to salt the water. Drain the pasta. Use a large, deep and oven-proof casserole dish or baking pan. Add enough meat sauce to the bottom of the casserole dish to cover. Add a layer of spaghetti, sprinkle about ½ cup of shredded cheese, cover with sauce. 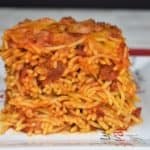 Repeat, layering the spaghetti, cheese and sauce, until all of the ingredients are used up, end with the tomato sauce on top. Reserve about ½ cup of cheese to melt on top at the end. Place the casserole dish on a baking sheet, just in case it bubbles over it doesn’t make a mess of your oven. Plus it makes it easier to remove the casserole dish from the oven. Bake the spaghetti for about 30 minutes. Remove the baked spaghetti from the oven, top with the remaining cheese. Place it back in the oven and bake for approximately 5 more minutes until the cheese melts. 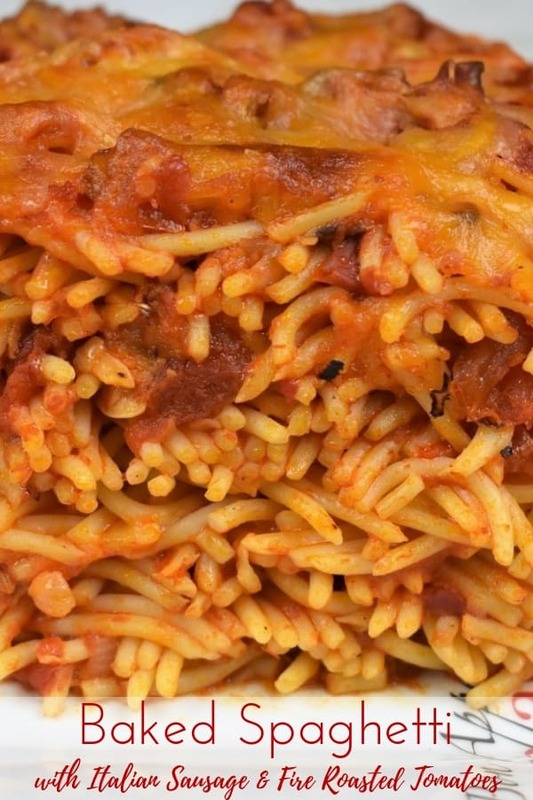 This baked spaghetti is really easy to make, and is sure to become a family favorite. We start with convenience ingredients like jarred pasta sauce, but add a special touch with onions, lots of garlic, flavorful Italian sausage, and fire-roasted tomatoes. Heat the olive oil in a large, deep skillet or pot over medium heat. Add the onions, cook 3-5 minutes, until they start to soften. Stir frequently. Add the garlic and oregano and cook 1 minute, stirring frequently. Add the sausage to the pan and raise the heat to medium-high. Stir the sausage, breaking it up using a wooden spoon or a spatula. Cook approximately 5 minutes until the sausage is brown. Add the chopped tomatoes and the pasta sauce to the sausage and stir well. Bring the sauce to a simmer, lower heat to medium-low and cover. Cook the tomato sauce for 30-35 minutes, keeping it at a simmer. Stir occasionally. Use a large, deep and oven-proof casserole dish or baking pan. Add enough meat sauce to the bottom of the casserole dish to cover. Add a layer of spaghetti, sprinkle about ½ cup of shredded cheese, cover with sauce. Repeat, layering the spaghetti, cheese and sauce, until all of the ingredients are used up, end with the tomato sauce on top. Reserve about ½ cup of cheese to melt on top at the end. Place the casserole dish on a baking sheet, just in case it bubbles over. Bake the spaghetti for about 30 minutes. Let the baked spaghetti set for a few minutes before serving.